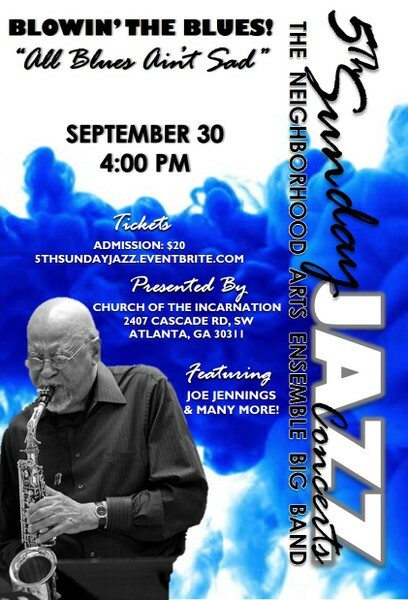 The Neighborhood Arts Ensemble (NAE) is a 20-piece instrumental ensemble founded and directed by Joe Jennings. The NAE was organized in the mid-‘70s at The Neighborhood Arts Center, directed by John Riddle and John Eaton. The Ensemble was a part of the Mobil Jazz Atlanta project, taking Jazz music to parks, schools and underserved parts of the City of Atlanta. In the initial years, The NAE featured the music of Atlanta native, the late Duke Pearson. The Ensemble has opened for Ray Charles at Atlanta’s Chastain Park, performed with Nancy Wilson, Salsa Meets Jazz at the National Black Arts Festival, and the Atlanta Free Jazz Festival with Cecil Bridgewater and Vanessa Rubin. After an extended hiatus, the NAE is back in action. The group currently performs in the 5th Sunday Jazz Concert Series at The Church of The Incarnation and in the First Friday Series at First Congregational Church. The latest version of the NAE features the music of Duke Ellington, Duke Pearson, Cecil Bridgewater, Frank Foster, Charles Mingus and many others. The NAE is composed of a cross-section of fantastic musicians living in the Atlanta area and continues to be a means of preserving and sharing the legacy of the great composers and arrangers for Jazz orchestra.